The Cinevate Atlas 10 FLT 26" DSLR Slider sports the same durability of the heftier Cinevate Atlas 30 DSLR 47" Slider but is a fraction of the weight (5.5 lbs vs 17 lbs). It is only 2' long, which makes this a great choice for the traveling shooter. It supports payloads up to 25 lbs, which is suitable for most DSLR video setups. This slider comes with an adapter for attaching flat base video fluid heads, which are not included and need to be rented separately. The adjustable all-terrain leg system can be adapted to any shooting environment and you can optionally attach the slider to a pair of tripods or C Stands. 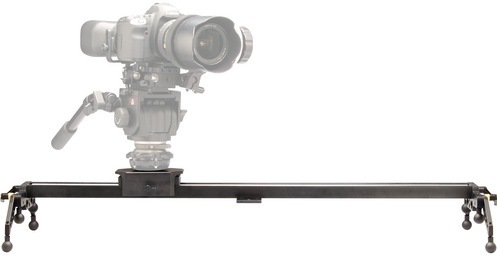 This slider is ideal for on-the-go video and time-lapse projects. • This slider comes with a 3/8th screw mount for flat base fluid heads (heads are rentable separately).